Last year, Ariel Donovan's life was shattered. She lost a friend, a love, and her sight into the afterlife. She's only beginning to move on, facing a summer without school as a distraction. Then she dreams of the mysterious Dexter Orphanage again, the place where all the trouble began. She decides to follow through on her dream, and her discovery turns her life upside down, for the second time. With the unlikely return of an old ally, Ariel begins to unravel the web of deception in the small town of Hell. She learns that her grandmother may have seen what she saw, and finally discovers the trail to the truth about what happened to her best friend Jenna. When Henry Rhodes comes back into her life unexpectedly, she realizes that she just might need his help to stay sane. Because the ghosts are real. This is the second installment of the Gravity series. (Read my review of the first one: HERE ). Abigail Boyd took a great concept and spun it into an extraordinary tale of a girl who pushes through no matter how many obstacles get in her way. 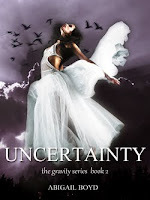 In Uncertainty, Abigail answers a lot of questions that readers may have had in the first one. Without revealing everything, she satisfies the reader’s curiosity until the rest of the series comes out ( the 3rd and 4th books come out THIS MONTH!!!) This was a great sequel to the first one and I thoroughly enjoyed every chapter. Uncertainty, like Gravity, was fast paced and interesting the whole entire book. Ariel became stronger in this book in my opinion and Henry kind of ticked me off, but hey he is a teenage boy so I guess I can cut him some slack! The characters were once again amazingly detailed and complex. I love that in a book, I don’t like shallow characters that have no depth or charisma.